Prode HED is a Microsoft Windows application developed by Prode, compiled with Microsoft Visual C++ and compatible with 32 and 64 bit versions of Microsoft Windows. The interface features graphing capabilities, easy editing and choice of different units of measurement. 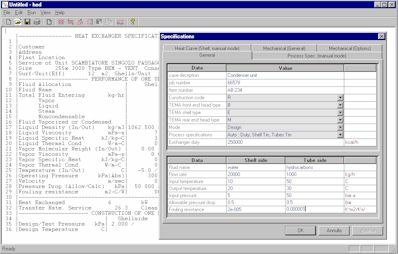 Prode HED includes Prode Properties to predict fluid properties and heat curves for pure fluids and mixtures. Fluid properties may be specified directly by the user or calculated with Prode Properties. Rigorous heat curves with Prode Properties. Single phase fluids in laminar, transition or turbulent flow regime. TEMA type designations for front end, shell and rear end. Single, double and triple segmental baffles. Tube layout may be 30 or 60 degree triangular, 45 or 90 degree square. Properties of mixture including VLE (multizone analysis). Comprehensive information on shellside and tubeside heat transfer coefficents.